In Ezekial Jalloh's cramped 12 by 15 foot dorm room at American University, it's hard to imagine living comfortably with another person, much less a visiting stranger. But over the past two years, the 21 year old has hosted 15 travelers on his small, inflatable air mattress. WASHINGTON – In Ezekial Jalloh’s cramped 12 by 15 foot dorm room at American University, it’s hard to imagine living comfortably with another person, much less a visiting stranger. But over the past two years, the 21 year old has hosted 15 travelers on his small, inflatable air mattress. They’re not visiting friends, and Jalloh is not operating a lodging business out of his dorm room. The visitors are members of a growing hospitality exchange service called Couchsurfing. Founded in 2004 by California residents and traveling enthusiasts Casey Fenton, Leonardo Bassani da Silveira, Sebastien LeTuan and Daniel Hoffer, Couchsurfing is a website which allows members to locate hosts in countries they’re traveling to and crash on their couches for free. The opportunity to meet people from different countries is why Jalloh offers his mattress. Users can create an online profile and browse profiles of members in cities or countries they wish to visit. The traveler then contacts a host and sets up a meeting place. While the ease of the process is one of Couchsurfing’s charms, it does raise some concerns about Internet anonymity. The potential dangers are prevented by the verification process each profile goes through to ensure member protection, according to Couchsurfing spokeswoman Colleen Sollars. However, D.C. Couchsurfer Emily Hautamaki, 26, says it is the close Couchsurfing community that makes the experience exhilarating rather than daunting. Couchsurfing may sound like a cheaper version of Airbnb — an online website in which homeowners can post rooms for travelers to stay in their house or apartment for a fee — or just a way to skimp on hotel costs, but members say it’s more than that. Couchsurfing allows travelers to see parts of a foreign city they may not have if they were stuck in a tour group. As Hautamaki says, Couchsurfing makes traveling more personal. 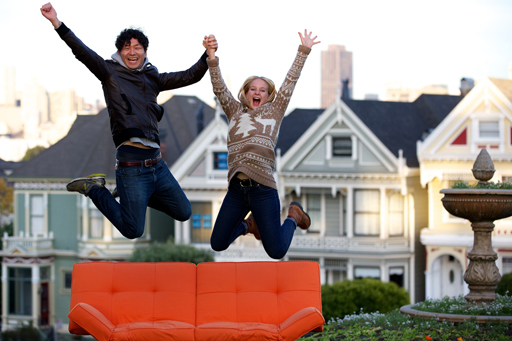 Based in San Francisco, Couchsurfing has nearly 6 million registered users, with members in more than 97,000 cities in every country in the world, according to Sollars. D.C. has more than 13,500 members who regularly host travelers. The organization, which started as a non-profit organization, transitioned to a for- profit corporation in 2011. While the number of members is growing, the site hasn’t lost its intimate appeal. “It’s almost like you’re building a global network of friends that you can always count on,” Jalloh says. Couchsurfing is part of a movement of collaborative consumption, a recently- popularized economy model based on sharing resources in a community. The movement is taking root in more start-up companies, including local transportation services such as Capital Bikeshare, Zipcar and Car2go. Couchsurfing has been referred to as one of the grandparents of collaborative consumption in the sharing economy, Sollars says. “There are so many companies popping up now where people are…finding ways to share more in communities,” Sollars says. For some members who don’t have many means to travel, hosting travelers and learning about their cultures is appealing. For D.C. resident Hautamaki, who has never considered herself a particularly outgoing person, Couchsurfing has given her the ability to connect with people she never would have met otherwise. “It was one of the best decisions I’ve ever made, and it’s really improved my confidence and made my life much more rich and full,” Hautamaki says. Jalloh, who is also a naturally reserved person, described a defining Couchsurfing experience with a young Polish man with Rastafarian dreadlocks. The Couchsurfer, Adam, was fascinated with Rastafarian and hip-hop culture, so Jalloh took him to “art night” in Chinatown. When Adam spotted several people on the street dancing and drumming, he started to spontaneously dance alongside them, to Jalloh’s surprise. Before he knew it, Jalloh started dancing as well. “You think you’re going to teach your Couchsurfer more about your own environment, but sometimes they teach you something that you would never realize, or you’d do something out of character…” Jalloh says.